PMO Best Practice is a different sort of PROJECT in a box method template, with this framework we would create just one instance which is provided empty and the materials are added in in each category as appropriate by the discipline leaders in the organisation. It can be one person or the ownerships can be delegated as required. You can adjust the look and structure to match your organisation’s needs and brand. Administrators can also continue to refine that as practice matures and approaches develop. As it exists on your server you can give access to all users to be able to view the content held there. Users can use search to find materials within the framework library. Administrators often also include links to policies and guidance in your project and programme method templates. Consequently administrators can centrally manage the access to versioned controlled releases of such content. You can restrict external parties from seeing some materials using permissions if required. You can also treat different levels of users within your organisation in the same way. 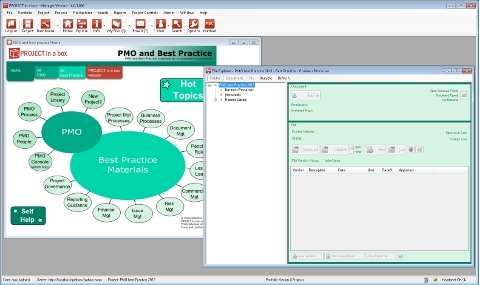 Most of all, this structured access to PMO best practice materials gives users great support. Giving users easy access to best practice and guidance is very helpful for good governance. Furthermore your maturity level will be greater when considering frameworks like P3M3. We first proposed the idea of this method template to assist one of our large UK customers. Because they lacked a centralised location for sharing best practice during PMO set up. Since then other well known organisations both in the UK and globally have proved and used derivative methods. Therefore over the years we have built and refined the PMO best practice method. Taking the experience gained from existing customers and making it available to new users. All customers have access to this PMO best practice as one of our standard method templates. Therefore making implementation quicker and easier.